Quantum Materials Achieves 91% Rec2020 Color Gamut Performance - The Independent Global Source for the Flexible and Printed Electronics Industry. 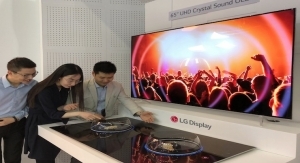 Achieves results with remote phosphor ‘on-chip’ quantum dot technology. Quantum Materials Corp. announced that it has produced and extensively tested a 100% cadmium-free remote phosphor (or “on-chip”) quantum dot LED technology that achieves an industry-leading 91% Rec2020 color gamut coverage. QMC is working with a number of LED component companies, display manufacturers and chemical companies to bring this next-generation technology to market as a superior and lower cost solution to the current industry practice of incorporating quantum dot infused films into LCD displays to increase color gamut and improve viewer experience. One of the most efficient ways to achieve a very wide color gamut LCD display is with narrow-band red and green quantum dots deposited directly on the surface of blue phosphor driven LED’s that serve as the light emission component of the BLU (backlight unit). Unfortunately, producing very narrow color emission materials that are both cadmium-free and possess high stability characteristics when placed in close proximity to LED’s has to date been a major stumbling block in the development of this class of quantum dot-enhanced display technology. To break this impasse, QMC has developed cadmium-free green quantum dots with an extremely narrow FWHM (full-width half max) of 16 nanometers. Importantly, QMC is able to produce these infinitely small semiconductors with precise emission wavelengths that possess high stability characteristics when placed in close proximity to LEDs. 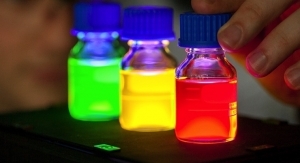 By combining these materials with QMC’s cadmium-free red quantum dots and proprietary encapsulation process a color gamut of 91% Rec2020 was achieved. 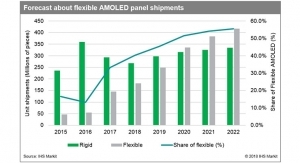 That level of broad color gamut rendering improves the present class of industry-leading quantum dot (film based) displays manufactured and sold by one of the world’s leading display OEMs by just over 20%. QMC’s “on-chip” LED technology recently passed the 10,000-hour on-time testing level with virtually no change in overall performance (FWHM, PLQY and target emission wavelength) and 30,000 hours accelerated testing protocols are now forthcoming. In addition to materially widening the color gamut rendering capability of LCD based displays, QMC’s “on-chip” quantum dot solution will likely improve both viewing angles and overall display brightness levels by eliminating one or possibly two additional film layers thereby allowing more light to reach the display viewing surface. 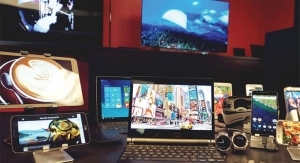 This variant of quantum dot display technology also holds the potential to provide additional manufacturing flexibility by being a “drop-in” solution.